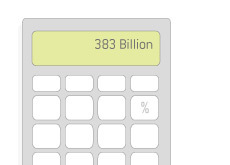 The cost of paying interest on trillions upon trillions of dollars of debt? Not cheap. According to TreasuryDirect.gov, the United States paid $383,071,060,815.42 (that's about $383 billion) on "interest expense on the debt outstanding" for the 2009 fiscal year. Amortized discount or premium on bills, notes and bonds are "also included in the monthly interest expense." For the 2010 fiscal year, the United States has already dropped nearly $165 billion dollars. The $383 billion figure is staggering, but it's not the most that the country has paid in interest expense over the course of one year. That distinction belongs to 2008, when the United States shelled out over $450 billion for interest expense on the debt outstanding. The reason that the 2008 figure is higher than 2009, even though the United States borrowed over a trillion plus dollars last year alone? Higher interest rates. Don't expect the amount that the United States pays for interest expense on its debt to begin to drop anytime soon. As a matter of fact, the CBO (Congressional Budget Office) estimates that the United States will be shelling out approximately $723 billion in net interest spending on the public portion of the national debt by 2020. (Public debt is the total national debt, minus intragovernmental holdings. Public debt includes debt owned by foreign governments, individuals, pension funds, etc). This number is expected to soar over the next decade due to increasing interest rates and a rapidly expanding national debt load. The United States, which owes approximately $12.3 trillion dollars as we speak, is expected to have a total debt load of around $20 trillion by 2020. Bottom line - it's very expensive to carry this much debt.